- INTRODUCING - The iMeister Original Bluetooth Wireless Headphones, designed in the UK and crafted with ultra-lightweight materials, the iMeister Earphones are ergonomically designed to provide maximum comfort matched by the latest audio innovations that produce HD quality sound with deep bass and crystal-clear treble. - ULTRA LIGHTWEIGHT AND TRUE HIGH FIDELITY SOUND - Featuring the latest technology and state of the art acoustic components the iMeister Original produces incredible sound quality whilst remaining lightweight and super comfortable to wear during intense workouts. 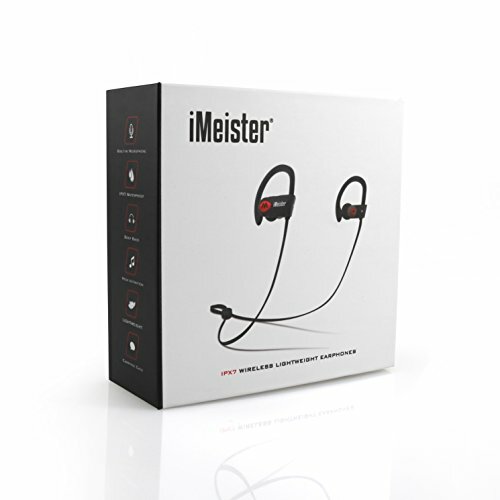 - SECURE FIT WITH IPX-7 WATERPROOF RATING - iMeister Original features ergonomically designed flexible ear hooks with gel flex silicone and premium foam earbuds to ensure your earphones stay comfortably firm in place to guarantee fatigue free ears and comfort. - BLUETOOTH WIRELESS TECHNOLOGY WITH CVC 6.0 NOISE SUPPRESSION TECHNOLOGY - Connect seamlessly with all Bluetooth enabled devices. With Noise Suppression technology focus on your favourite music and answer calls without skips or missed words. - LONG BATTERY LIFE - The new and improved lithium polymer battery allows seamless enjoyment of music for up to 8 hours and 240 hours stand-by with a quick charge of only 1.5 hours.